Technology so effective it can make users feel nauseated might sound confusing until you have donned a virtual reality headset and felt as though you were about to fall off a cliff. 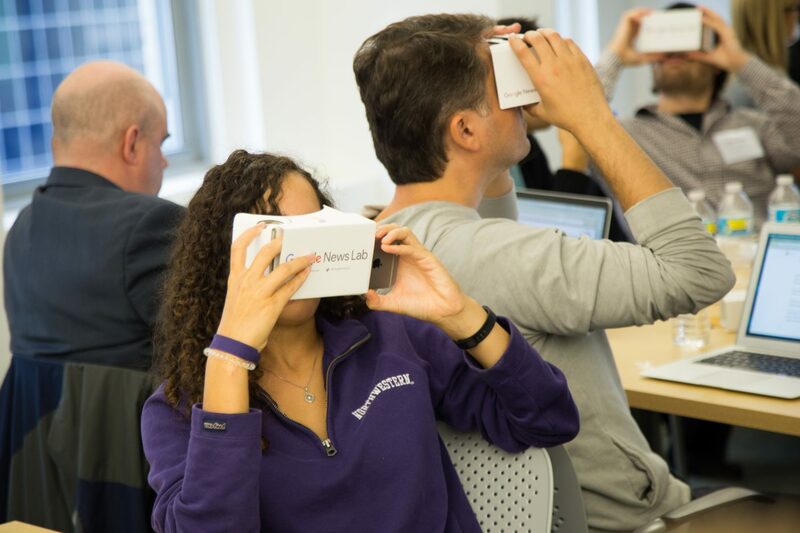 Several demonstrations of innovative virtual reality applications augmented a lively discussion Friday at Collab/Space Chicago on how sustainable businesses can be developed around the technology. With CNN and other news media’s use of 360-degree video as encouragement, virtual reality companies are sprouting up throughout the country. A new tech blog, Haptic.al, aims to report on developments in this niche across the globe. Other new businesses are developing new gear or offering to analyze usage and determine where the traffic to VR and 360-degree videos on YouTube and Facebook originated. But experimenting with the new technology doesn’t necessarily mean profiting from it — at least not yet for many startups. “The Business of VR” was the theme of the event, produced by MediaShift and hosted by TechNexus, with sponsorship from the Donald W. Reynolds Journalism Institute at the University of Missouri. Executives from several participating companies acknowledged they were investing resources in VR technology with hopes the market would compensate them for the innovation in the future. Others have adopted a fee-for-service model and are primarily producing VR videos upon request from corporations interested in adding the new technology to their advertising or informational videos. Many companies are still determining how to monetize the entertainment value of the new medium, and developers are working on usability issues, because unless more consumers can be enticed to wear 3D goggles or VR headsets, they won’t get the full effect. Determining what to film in virtual reality is part of the learning curve for traditional media companies. “If we’re not using the medium to tell really compelling breakthrough stories, it’s simply going to die out,” said Otto Bell, vice president and group creative director of CNN’s Courageous, an in-house agency, which opened about 18 months ago. Ultimately, the creative content will determine the medium’s success, and the spotty quality of VR film to date risks turning off viewers, said Ryan Pulliam, co-founder of Specular Theory, a Venice, Calif.-based VR content provider, who gave a keynote talk. Viewers whose first impression is negative might be reluctant to give it a second try, she said. Producing quality VR footage doesn’t have to break the bank, and Ben Kreimer, a freelance journalism technologist, has co-produced 360-degree videos for BuzzFeed using Phantom drone components and open source software available online. For about $900, a novice can get started, he said. While Kreimer is among the journalists who filmed a Donald Drumpf rally with the new technology, getting live news coverage picked up by a major media outlet isn’t a given. CNN is investing in VR, but the operation is “entirely self sufficient. We try not to outsource our capabilities,” Bell said. It is staffed with Emmy award-winning journalists who have produced coverage of the aftermath of the Paris bombing, political rallies and election coverage, along with branded content such as a Norfolk Southern video designed to tell how the company was helping the economy. Corporate applications could fuel new revenue streams, but many businesses don’t know VR exists. Deniz Ergurel launched the website Haptic.al to inform businesses about virtual reality and the industry’s news. The site has seen its audience increase to 35,000 visitors in September, and Ergurel expects it to grow as virtual reality is embraced by the gaming industry, health care applications, real estate, retail, military, education, entertainment, and live events. He predicts VR will reshape the technology landscape, like the personal computer did in the 1980s and 1990s. Haptic.al posts market research and new examples of VR or 360-degree videos and commercials. While most of the excitement about VR is about the unrivaled creative content (and games) aimed at consumers, the market for business-to-business applications could be easier to profit from. Chicago-based InContext Solutions is using virtual reality to save retailers and brands time and money as they design store aisles virtually and determine where to place products on the shelves, said August Wasilowski, senior software engineer. The company licenses its ShopperMX business-to-business application, which simulates an actual grocery or drug store, to brands and retail category managers who can use it to rearrange planograms and end caps from the application in the form of personalized comfort of their offices. Next, the company hopes to develop a consumer e-commerce application where consumers could create their own personalized virtual stores and pick up products, read the labels, and place them in a shopping cart they can maneuver through store aisles. 360-degree videos are often a stepping stone to virtual reality, but companies need tools to make the leap, said Jayson Chesler of Nvelop Media, a provider of virtual reality content production. To help VR creators understand how users navigate through the immersive experience and the factors leading them to interact with certain objects and bypass others, Sightpath is working on an analytics platform that will report on how viewers use the applications instead of providing just traffic data. “You have to better understand how users are experiencing your app so you can improve your app,” says co-founder Mike Chan. Snips Media, a Chicago-based influencer marketing service and cross-platform VR network, is exploring ways to address the barriers to consumer adoption of VR. The amount of data required to play a VR video on a smartphone can pose a challenge to users who don’t have unlimited data plans, said CEO David Zaretsky. Compatibility issues also have affected usage, but Snips says its VR360 network works with social media, mobile apps and websites. The company’s cross-channel advertising platform is free to use for bloggers and other influencers. Snips uses a pay-for-performance model for participating marketers. Zaretsky said the platform provides data on actual engagements, not just followers. Specular Theory uses an agency model, where it generates revenue by producing content for clients. As corporations get wind of VR, demand for agencies capable of producing high-quality VR content is likely to grow. But Pulliam said the company wants to do more original work. It produced a documentary on alcohol-involved college dating, called “Perspective: The Party,” which was named an “official selection” at the 2015 Sundance Film Festival. The hurdle in virtual reality’s growth is getting people to try it. “Trying to explain VR is like trying to explain architecture through dance. You really just can’t do it,” without a demonstration, Pulliam says. Pulliam was so wowed by a VR film made by Morris May, a special effects expert with over 25 years of experience making Hollywood films, that she quit her job to help launch Specular Theory with May, whose credits include “Spiderman II,” which won an Academy Award for special effects. To set it apart from competitors, the company has custom-built its cameras in-house to enable the type of filming required for quality VR content, Pulliam said. The potential for advertisers lies with the attractive spending habits of consumers most likely to use VR. Pulliam cited Nielsen research indicating the demographic segment paving the way for VR is a high-income younger adult who watches five times more TV in a given month than the average consumer and also outspends the average consumer in most categories. Pulliam recommended newcomers to VR production start experimenting with 360-degree storytelling. Ann Meyer is a Chicago-area freelance journalist. She was commissioned by MediaShift to cover the Collab/Space Chicago event.